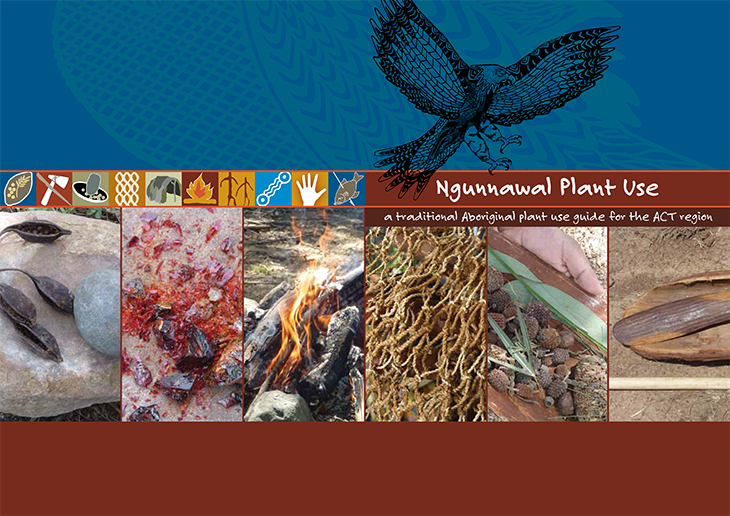 A new field guide, Ngunnawal Plant Use, provides information on the native plants of the ACT region and their many Ngunnawal uses. The ACT’s Traditional Owners, the Ngunnawal people, used and continue to use the plant resources of this region for food, medicine, tools and weapons, fire, ceremonial purposes, water, fibre, dye and paint. Through Access Canberra – call 13 22 81. The $22 includes postage and handling for purchases made from this website. If you are a retailer and would like to purchase copies of the book at a wholesale price to sell to the public, please contact the Environment and Planning Directorate. If you don’t have access to the web for online payments – call Access Canberra 13 22 81 and they can assist you to purchase the book. Proceeds from the sale of the book will support Aboriginal natural resource management in the ACT. The book was developed by the Environment and Planning Directorate (EPD) in partnership with the ACT Parks and Conservation Service, the United Ngunnwal Elders Council, the Ngunnawal community, Greening Australia, EPD Aboriginal trainees employed under the Caring for the Cotter catchment project and Murrumbung Yurung Murra staff (a network of ACT Government Aboriginal staff working in NRM, Heritage and Parks).Graphic Design and Production by Carolyn Brooks Illustration and Design. Funding for the book was provided by the Australian Government. For further information about the book – call 13 22 81 or email: AboriginalNRM@act.gov.au.